CHRISTAN Farm is on a 40 acre property in Bindoon Western Australia. Bindoon is in the beautiful Chittering Valley, wildflower country in spring. Stan and Christine Pietraszek and family started way back in 1990 with no thought of farm names. We slowly established ourselves, starting with a small flock of coloured mixed breed sheep that we brought with us to the farm, we then built our home and of course a shed. The farm grew from the land up. In the early years we raised mostly sheep and purchased an occasional Angora goat, the sheep enjoyed being introduced to a new Goat! As well as a vegetable garden we also grew the occasional oaten n’ hay crop. Both Stan and I had full time external jobs as well as a teenage family to rise. The farm was a great environment to raise our children. Although our children have grown up and have families of their own now, the love for the land, as well as my textiles background has always remained close to my heart where it still remains to this day. Stan and I were originally introduced to Alpacas by an acquaintance. Being a fibre worker of 30 years and a textile worker of many more years, I was very passionate and loved working with fibre, the Alpaca fibre quickly caught my attention, and it was love at first sight. Stan and I fell in love with Alpaca’s, and our shared love of the land continued. After further researching the industry, in 2005 we purchased quality foundation stock and as a shared passion. It was at this special moment we became CHRISTAN Alpacas. In 2016 we officially named our property CHRISTAN Farm which is now the home of more than 30 beautiful Alpacas of both types, the Huacaya and Suri, as well as the home of over 40 Corriedale and Merino Sheep. Over the years we have learnt through experienced, as well as from other passionate breeders, National and International show Judges and enthusiasts alike. 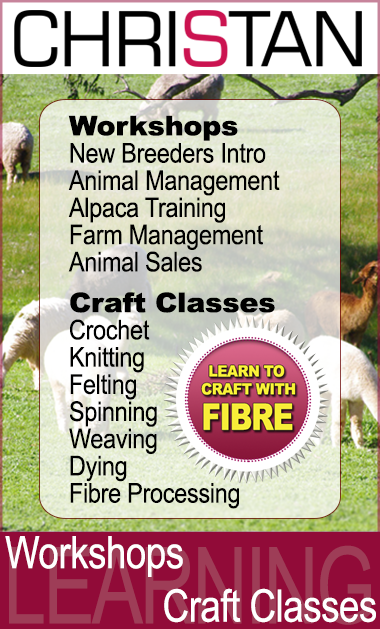 We attend many shows with our alpacas where we are able to share knowledge with other breeders. Sharing knowledge provides us with valuable information about where we all are in the industry regarding growth and continuous improvement. When training opportunities used to present, we were always there. Today, however we are proudly taking pleasure in teaching others. I think, like most things you learn through doing and enjoying the whole learning process along the way. Currently, both Stan and I actively select breeding pairs for improvement, fibre production, and excellence. Excellence in fleece quality flows through to the textiles I create as a fibre artist. If You Want The Absolute Best! Having the absolute best products to work with when designing and creating the highest quality projects will always be our aim. CHRISTAN has both Alpaca and Sheep fleeces and occasional animals for sale. Breeders seeking to improve animal and fleece quality regularly request the use of our beautiful Stud animals. 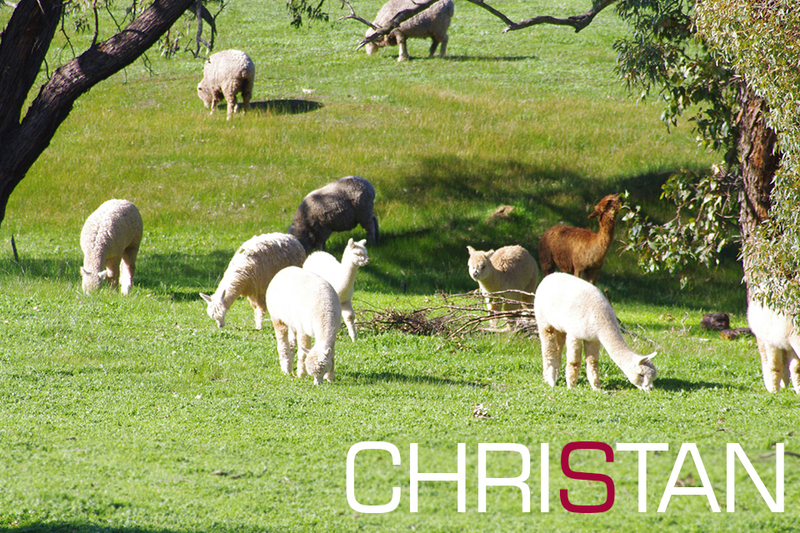 CHRISTAN Stud services are available to Australian and International Breeders. After many years with Alpacas we have both met many wonderful people who share our passion, love of the land, and love for animals.